We moved our previously announced February event at The Crescent Moon Alehouse to April to accommodate the kick-off to AIGA Nebraska’s 22nd year of events and programs. 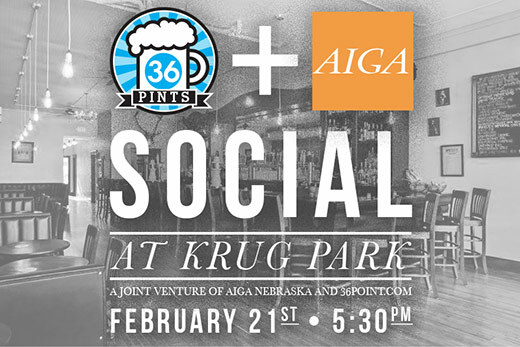 As a special February 36 Pints at Krug Park, the first 36 Pints will be provided by AIGA Nebraska and 36 Point. Join us for 36 pints + AIGA Social in 3 weeks. After that, we have the Eleven19 open house, and then… to The Moon! I realized, hey, since I wrote about how great The Blatt was for Neenah Paper last month, let’s start the year of 36 Pints there. We’ll follow up with a February April event at The Crescent Moon, and then go off schedule once again for an Eleven19 open house! So, if you’re a creative, or want to be a creative, in the Omaha area, stop by, we’d love to see you at 36 Pints. Updated 1/18/13: Our February venue is being moved to April. We’ll be announcing a new February location shortly. We may have wrapped up The Reflex Blue Show for the year with episode #100 earlier this week, but that doesn’t mean we’re wrapping up our other ventures over at 36 Point. We’re still lining up @11:19 lunch events with the area’s great creatives (fee free to contact us to participate); ace reporter Ben Lueders will be bringing a few recap podcasts from Design Camp® 2012 next month; and we have a full slate of 36 Pints to finish off the year! I personally chose this week’s location, and moved the start time back an hour. Why? It’s the day before my birthday, and this is my official birthday celebration – so stop by! Tom Nemitz and Ben Lueders picked the locations to round out 2012. And because the holidays always causes scheduling issues, we moved the November and December events to the 2nd Thursday instead of our regular 3rd Thursday spot. Hope to see you Omaha area creatives at 36 Pints! As we hope to see many of you tomorrow at The Redeye for 36 Pints, we decided it was time to announce the next two spots. So far, we’ve had fun doing this, but I have a meeting right beforehand on the dates we set, and these look like they may run long in the near future, so we’re moving 36 Pints to the third Thursday of each month after the tomorrow’s event. July we’re taking the event to Benson, and in August, we’re going old school mid-town Omaha. We also added Facebook event reminders, so feel free to RSVP and/or invite friends. See you there. Thanks everyone for showing up to the Eleven19 open house last month (photos here), which was also the first of our 36 Pints. We’re excited to bring a reason for designers to just get together and chat after work on a monthly basis to Omaha, and we hope to see you tonight at The Homy Inn. Feel free to stop by for a couple minutes, or stay a few hours. Also, I guess we are taking requests for future locations (requests should be made in person at a 36 Pints event). Heidi recommended we go to the Interlude Cocktail Lounge next (May 9), so we are. And, as this event started partially from conversations I had with Tom Nemitz, we’re going with his pick after that (June 13) at the Redeye Tavern and Grill.